Panoramic camera copies are regularly for sale at auctions, usually with several exposures on one roll of film. Frame 2333 in my possession. Unfortunately I do not have a good flatbed scanner. Nor am I able to scan all of it without risking damage to the film. I have scanned two parts of it with my Canoscan LiDE 600F. But worry not, I will cut the film into 10x8 or 10x4 negatives and have each of them scanned at 5000 DPI at a pro scanning lab. The scanner will be a high quality drum scanner, and I will request the files in raw TIFF format to ensure as much dynamic range as possible is digitized. I will of course add those scans to the archive.org link above. For now, you can find and compare my LiDE 600F scans to NASA's scans of the original. This will put an end to anyone who is ignorant enough to think this photographic quality was not possible in the 70's, or if NASA just made it up some 10 years ago with CGI. Like anything in the NASA archives, it existed in analog form well before any internet-dwelling conspiracy theorists found their netscape. I love the PanCam images, the quality is incredible and not that far off what has been achieved by the LRO. I really wouldn't cut the negative though - it seems a shame to damage something like that. 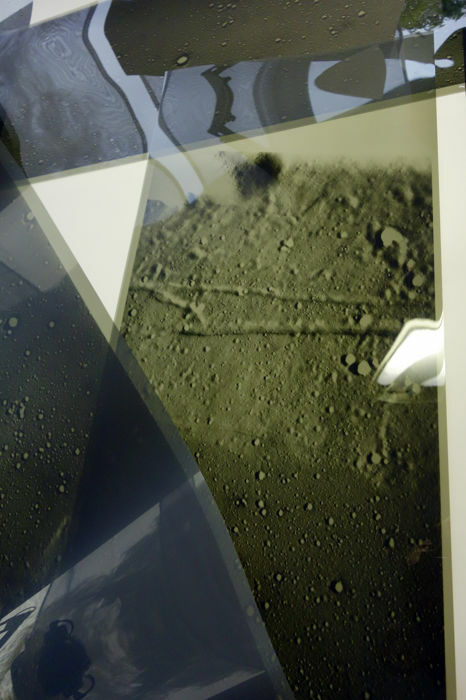 I read somewhere a few years ago that the prints of Apollo 15 orbital photos that were released shortly after the mission were of deliberately lower quality than could have been published. NASA didn't want the Soviets to know just how good their orbital imaging capability had become. Yes it is a shame, but I really want to have it scanned. I do not know of any scanning service that can scan 200x25cm in one go. marchtothemoon used a modified LEICA scanner to scan the panoramic images. Also, if it were to be scanned as one image, you would need a mental amount of memory to open it. I got someone who is interested to scan it with an Epson Perfection V750, which has about an optical resolution of 2500 DPI. I still need to respond to him, but it is promising to have get a basic scan done. He lives in the same country as I, so the shipping cost and risk is minimal. A scan at 2500 DPI will yield a resolution of 4843 megapixels. A scan at 5000 DPI will yield a resolution of 19 gigapixels. A scan at 11000 DPI, the theoretical limit of the custom scanner, will yield a resolution of 94 gigapixels. Would anybody be interested in a contact print directly from original negative? either smaller, 1:1 scale or even larger than the original negative. I am talking about a completely analog, chemical copy from the negative, no digital print. It may be done by a hobbyist at a reasonable price. If enough people are interested he may do a bunch of them. So if you have interest, please reply. someone is making a scan of my apollo panoramic negative with his epson v750. His is clearly better than mine, but the scanner bed could use a clean. Left is mine, right is V750. Both are scanned at 1200 DPI but he will do a 2400 DPI scan later. This is just a minescule part of the 200x25cm negative. A panorama of our scans! Hans once tried to stitch the scans with photoshop, but that software did not work. I've been working on the 'Microsoft ICE 2.0' software for a few days now, and wanted to try something really big. The software can theoretically stitch panoramas of several gigapixels gigapixels, as long as you wait long enough, and have enough disk space to make the process dumps. I used the 13 JPGs scans from hans. I reduced the export picture to 42226x4550 pixels, the PNG file is 132 MB.